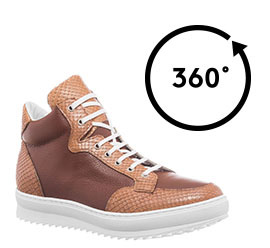 Handmade high sneakers, which can add 2.4 to 4 extra inches to your height, with unique upper made of soft dark brown calfskin enriched with precious details in genuine python leather of a light brown colour. The outsole made of rubber, 100% natural and super lightweight, gives maximum stability and durability. Luxurious elevator sneakers with a classic design.